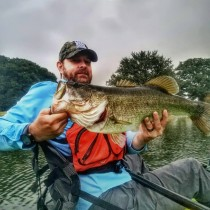 I recently had the chance to catch up with Robert Field, President of Kayak Bass Series. Event #1 was in the books and I asked him to reflect on a few things to share about the event. Here is the interview and a video about the first stop in Astor, Florida. Q: You guys wrapped Event #1 in Astor FL a couple weeks ago. How’d it go? It went really well, better than I was prepared for if I’m being honest. Organizing events like these takes more work than I ever imagined, and with so many parts I sort of assumed something catastrophic would happen at the first one. Quite the opposite occurred. The feedback has been overwhelmingly positive, the competitors all seemed to have a great time, and other than a few minor hiccups the first event went off without a hitch. Q: What things really surprised you at the first event? Well first of all, the fishing was really tough. We thought Florida in January was a slam dunk, but a few cold fronts wound up making it tough on the competitors. I was also surprised by the response to the iAngler Tournament System the competitors use to score their fish. I had some apprehension about issues arising on tournament day, but overall it went very smoothly and even the guys who expressed concerns beforehand ended up telling us how much they liked the app. Q: Are there any changes coming before Event 2 in TX? I noticed you posted there might be a few tweaks based on feedback. What might those be? At the KBS, we pride ourselves on listening to our members. Now obviously we can’t appease every individual out there, but if there’s a better way we can do something, we want to know about it and we want to act on it quickly. We’ve made some tweaks to the CPR Rules when scoring fish, such as banning the use of bungies or stringers to secure fish on the Hawg Trough. These changes were made to level the playing field as well as for conservation purposes. We want to prioritize the health of the fish caught in our tournaments. We’ve also pushed back the late registration to just a week before each tournament instead of two, as we’ve worked through some obstacles in the way we collect and transfer the funds. Q: Tell me more about the real time scoring and iAngler app. How did all of that go? Again, to my surprise, the response has been great. Anglers loved being able to have their fish approved in real time (they get notified in the app when a judge has approved the photo and catch). It also drastically reduces downtime at the weigh-in since we aren’t having to manually tally up the scores. The live leaderboard was also a HUGE hit. We had a ton of traffic watching the competitors throughout the day, and received a large volume of messages, calls, and emails about individual anglers throughout the day. It’s a great way to get family and friends at home involved in the competition. The app also helps us catch dishonest competitors due to the information it automatically gathers from each photo when it’s taken. Q: I found myself following along at home to the cutoff time around noon. Any plans to keep it live until say maybe the last hour? Actually, yes. That’s exactly what we’ve decided to do going forward, again based on feedback from our competitors and those following along at home. We had no idea just how many people would be watching their husband, daughter, or friend climb up the leaderboard on tournament day. We’ve decided to keep the leaderboard up until 2:00 PM, one hour before the last fish can be logged. We are putting our foot down and not leaving it up all day in order to keep the suspense at the weigh-in. While we want those following along at home to have fun, our priority is the guys at the event and making sure the weigh-in is exciting. We put the leaderboard back up during the weigh-in so the people at home can find out who won in real time, too. Q: I noticed a ton of giveaways. Were those raffled by buying a ticket or was it just based on participants? We do not sell raffle tickets. Every single prize put up by our wonderful sponsors is given away to random participants. Their identifying wristband is what gets dropped in the bucket. We gave away almost $8,000 in sponsor prizes at the 1st KBS Open, everything from Manley Rods to a Power-Pole Micro Anchor to a Jackson Kayak Big Rig. We’ve all had those tournament days where the fish just don’t cooperate, myself included. We wanted to ensure that the guys who made the trip out but didn’t have a good day fishing still had a chance to walk away a winner. John Champion left KBS Open #1 with a new kayak despite not catching a fish on tournament day. Q: Has a date and/or location for the KBS Classic been set yet? The Classic will be around the beginning of October and the location will be somewhere central to the eastern half of the U.S. Somewhere in the Tennessee, Kentucky, Georgia, North Carolina region. We will be letting the KBS members vote on the location around halfway through the season after our Guntersville event on March 21st. This series belongs to the members, not us, so we want them to decide. That will still give those who qualify 6 ½ months to plan for it. Q: What didn’t go as smoothly as you’d hoped last week? As mentioned, we were prepared for a few hiccups at the 1st event of the season. There was some confusion about eligible launch locations, which we’ve clarified going forward. We also had a significant number of no-shows due to crazy weather up North, but all those guys were given a credit to use at any future KBS event of the season. The fishing also wasn’t quite as “on fire” as I had hoped. But we know we can’t control the weather, and we can’t control the fishing. All we can control is how we run the event, and we want to make sure we make them as fun and as fair for the competitors as possible. Q: What else should we know about the KBS? The big thing is that competitors must fish 3 events to qualify for the Classic. The Classic is a FREE event (no entry fee!) for all those who qualify, and every sponsor has put up 2-4x as much in prizes for the Classic. There will be huge cash prizes for the Classic Champion and Angler of the Year, so guys will want to find 3 events to hit throughout the season so they can make the Classic. We know there are a lot of tournament trails around the country, and we appreciate the competitors who fit us into their tournament schedule. We also want to see every trail out there do well. We don’t see them as competition; in fact, we’re partnering with a few of them to help propel the sport to the next level. We’re big believers in the concept that a rising tide raises all ships, so as we all help grow the competitive side of kayak fishing, every company and every angler involved will benefit. The KBS thus far has been a great event and is allowing many of us the opportunity to compete in waters that most of us would likely never venture too, along with an opportunity to land a fish of lifetime. I couldn't be happier with the event schedule, layout, and the way it's run. It's been a long time since I've been a part of the bass world and there's no better time than now to become a part of a great series. Today's column is written by CJ Scott who shares with us the three lessons he's learned moving from powerboat fishing to kayak fishing. Over the years I have often needed to change from Plan A to Plan B. A couple of times I’ve even used Plan C.